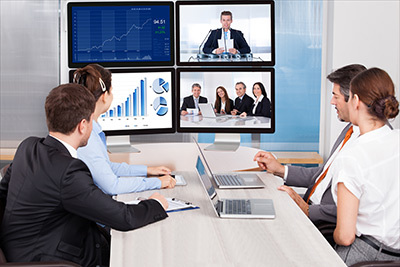 Video Conferencing and/or Audio Conferencing systems allows you to collaborate instantly with employees, customers and vendors no matter where they are located. These systems see a very tangible, and swift, return on investment (ROI) by cutting down on a multitude of face to face meeting expenses. Travel costs, air fare, car rentals, food, hotel etc. Countless hours of lost productivity, all while the traveler(s) is still on the clock. Meeting space costs, rentals, food, transportation etc. Conferencing systems give your organization increased flexibility, they encourage collaboration, accelerate the decision-making process, and allow for better inter-company communications. At Sound Stage, we have the products and expertise to integrate a reliable, easy-to-use Video Conferencing system into your facility. We design intuitively controlled systems that simplify operations of the latest technology to make our clients look great and feel confident when sharing ideas.